It’s a sure sign of spring in Sudbury when clusters of luscious green colour emerge from the fertile and moist soil. Covered in papery brown scales, these furled looney-sized vegetables are ferns, before they uncoil into fronds. And when picked at the right time, they are a delicious treat. We recently visited the home of longtime customers Dieter and Judith Buse in the south end of the city to learn more about these wild edibles. While there are many species of ferns found here in Northern Ontario, the ostrich fern is safe for human consumption. 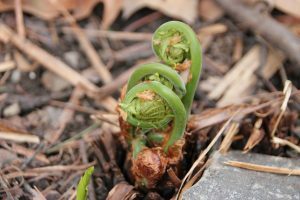 Named after their resemblance to a fiddle (violin) head, fiddleheads flourish in rich, moist wet soil with some sunlight, and are typically found growing near river banks, stream banks, edges of swamps and open woods. Dieter transplanted 10 ferns into his backyard garden from a marshy area south of Richard Lake. In the last few years, the fern’s underground root system has spread throughout his property, resulting in more plants, and more opportunities for Dieter and his wife Judith to embrace the eat local movement. 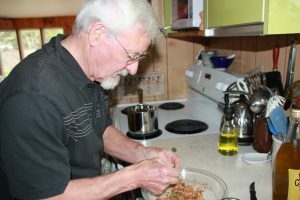 A retired history professor from Laurentian University and author, Dieter knows all the good spots to forage in the city and region. Come fall, he’s in the bush picking mushrooms. Dieter suggests picking fiddleheads when they are about the size of a looney; any bigger and they become bitter. Once picked, it’s important to remove the papery brown scales from the fiddleheads. 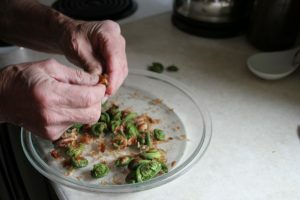 If you’re not in a rush, leave the fiddleheads aside and let dry, then knock them on the countertop, allowing the excess scales to come off. 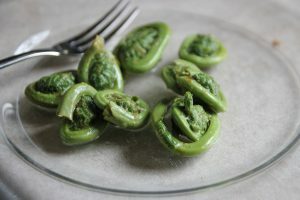 To prepare, boil a pot of water and then throw in the fiddleheads, cooking no more than 3 minutes. Drain and then enjoy with extra virgin olive oil, pepper and freshly squeezed lemon. You can also substitute olive oil with butter. At Verdicchio, we have pickled them added them to pasta and risotto, and served them as a side. Fiddleheads taste somewhere in between asparagus and young spinach. They are filled with health benefitting antioxidants, vitamins A and C, potassium, iron, magnesium and copper.